Mr. Mickey with me at Primland Resort in 2016. Mr. Mickey is my adventure partner in life. We have been dating for more than ten years. He is my photographer and my positive inspiration for living a full and elegant life. He usually plans our outings and wants to take pictures of everything we do to share with you. He is very proud of this project and enjoys sharing every date with you here on the blog. We love to meet you when we are out and about. Please always come up and tell us who you are if you happen to see us on one of our adventures. I am confident he will want to take your picture! I love fashion but at almost sixty years old I must use a different set of guidelines for putting together outfits than the gals featured in Vogue and on runways. Living in a small southern city and working within my clothing budget, I've learned to adapt current fashion to fit my lifestyle and social circle. Fashion is what you buy. Style is what you do with it. The way we present ourselves is unspoken communication. I want my style to convey that I am a professional woman with an awareness of trends while remaining appropriate, approachable and engaging. My career in the fashion industry began in 1976, working part-time in the Visual Merchandise Department at Parks Belk. Within a year, I was promoted to the Visual Merchandise Manager of three Parks Belk Department Stores. After serving four years in the United States Navy, I held the position of Corporate Director of eight Cosmetic Departments for Rices Nachman's Department Stores as well as the District Manager of a chain of boutiques. My first venture as a business owner was a consulting firm named 'Career Image', which also included speaking at seminars throughout the southeast United States to present the concept of using your best colors and clothing shapes to build a wardrobe that will work for you in any situation. I conducted personal consultations at the client's closet and then accompanied them on well-planned shopping trips afterward. My current position with my company evolved after being a professional boutique jewelry designer for more than ten years. As the President of Vintage Jewelry Supplies Company, I must know current trends in fashion and buy what is needed to fit those trends months in advance. As the editor of the blog Fifty, not Frumpy, I share tips, trends and wardrobe ideas for women of all ages but especially those who like me, become fashion challenged over the years. After a few years working non-stop or devoting our lives to children or aging parents, we often lose touch with style. Contact me by email at Susan@FiftynotFrumpy.com for inquiries. I no longer accept products in exchange for a review. I really like your site. Using yourself as the model for what fashion looks work best after 50 is really helpful - and original. HI Susan, I really love your blog and just now liked your facebook page. I especially enjoy your words of encouragement about starting over again. I am about to be laid off from the job I've held for 20 years. I also freelance write about beauty and healthy but it won't pay the bills (age 56 here). So naturally, I'm frightened. Your posts about beginning anew are inspiring! And you look lovely! I too, have a "subdued" personality, so this will be difficult for me. Will continue to watch you for inspiration! Love your blog. You're an inspiration with your fashion tips. You gave me some super new ideas on how to wear my navy jacket. Love the red pants with the neutral shoes and the jewellery. I have to start experimenting with contrasts. I'm still stuck in that time warp which dictated that shoes and bags should always match (dreary and ageing). I noticed that you also have fun with contrasting pieces of jewellery (am also trying that out too). I'm 58 and its time for a new look (like yesterday!). Keep up the good work. Best Regards, Di Redhead: Littlehampton: South Australia. I found your blog a few weeks ago, and have been in love ever since. Your style may be geared towards women over 50, but I just want you to know you officially have a 22 year-old fan! Stylistically, I tend to go for a more 'put together' look, accented with lots of color and maybe a few trendy items. Anywho, I'm a big big big fan of your blog and I look forward to seeing more timeless, easy going and flirtatious outfits! Hi Susan, I just found your blog and am loving it! Such helpful, practical yet appropriate hints for a 50 plus woman. I went through breast cancer in 2010 and the chemotherapy removed all my hair including eyebrows and eyelashes, and it didn't come back in as thick or as quickly as I would have liked. Plus then my reconstructed body was changed quite a bit and so I've been figuring out how to dress and wear makeup to allow me to look my normal self again for the past 3 years - wish I'd seen your blog about 2 years ago, but am glad to have found it now! I love the classic, age appropriate, yet NOT dowdy looks you've created - thanks for the great site. I'll be back! I am 59 and just discovered your blog. I think your look, which is my style - look good, but not Frumpy! I can carry this look into my sixties. Thanks for the outfits that are pulled together...again, my style. Thanks for all your wisdom and you are now my go-to blog when I need an outfit. I found your blog last year (?) and have enjoyed following you on Facebook. I'm Camille Goscicki,56 years old, and have always loved fashionable clothing. I really enjoy seeing your ensembles on polyvore, and often save the photos in my "style folder" for reference before shopping. 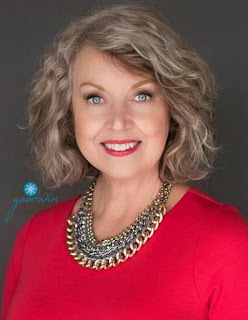 I'm back to writing my blog (www.beasgraceless-aging.com) and am planning on including a link to your blog (as well as others relating to fashion for us older but still youthful women) on an upcoming post. Dear Susan, I have just found your Blog and I love your Tips and sense of style. I will be back for more. I am looking forward to hearing you speak and hopefully meeting you when you present at the Hilton Head Island Bluffton Chamber of Commerce event. Love your story and can relate! I’m having trouble “re-entering” a stage where I care again after many years of “Mom-ing” and depression. Can you tell me what body shape you are? I am over quite weight and a pear. Can you guide me to images that will be flattering to my size and shape while I work on slimming down?